Abby Harrison recently received an invitation almost as rare as winning the Powerball lottery. ESA Astronaut Luca Parmitano has invited her as his guest to attend the Russian Soyuz-TMA-09M Launch to the ISS on May 28. Harrison has long been a fan of space exploration and STEM education, having attended Space Shuttle launches, toured space agencies, and met many scientists, astronauts, engineers and physicists from around the world. 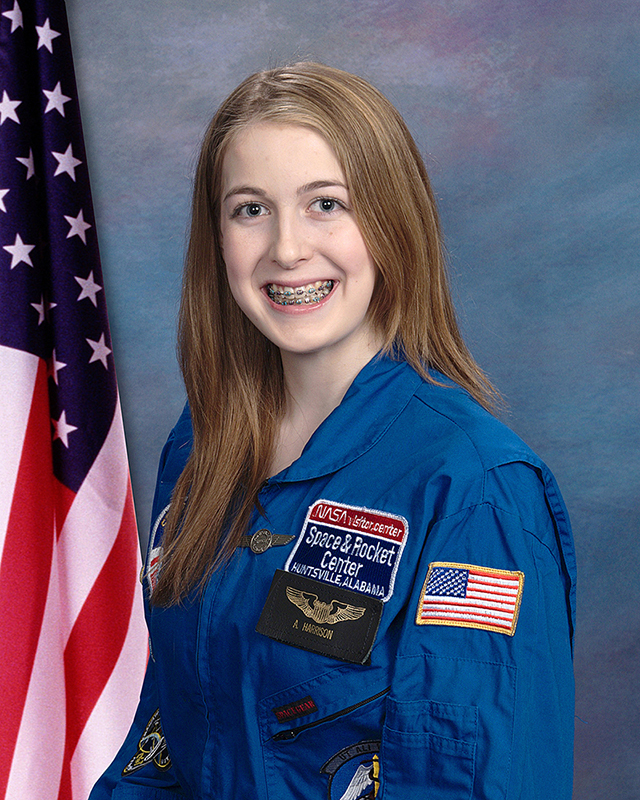 She writes about it all online at www.astronautabby.com as she strives to inspire kids to study and pursue STEM careers. For the Soyuz launch, she’ll be traveling first to Russia and spending four days there, before heading to Kazakhstan for the launch. Harrison will be sharing the experience after she returns by leading a series of Skype classroom chats with students and teachers. Sign-up for a random drawing to have your school be selected for one of these classroom chats at http://astronautabby.com/signup/ before June 14. She also has started a Rocket-Hub fundraiser campaign to defer some of the costs of her long journey to Russia. You may contribute to the campaign at www.rockethub.com/projects/22119. The NASA Space Settlement Design Contest is for K-12 students throughout in the world. Individuals or teams may enter. Grade levels are judged separately, except for the grand prize. Submissions must be received by March 15, 2014. For more information about the NASA Space Settlement Design Contest, visit http://settlement.arc.nasa.gov/Contest/. If you have any questions about the contest, please email Al Globus at aglobus@mail.arc.nasa.gov. NASA’s Lunar Reconnaissance Orbiter, or LRO, mission is sponsoring a pair of workshops for educators of students in grades 6-9. These workshops will focus on lunar science, exploration and how our understanding of the Moon is evolving with the new data from current and recent lunar missions. The Lunar Reconnaissance Orbiter has allowed scientists to measure the coldest known place in the solar system, map the surface of the Moon in unprecedented detail and accuracy, find evidence of recent lunar geologic activity, characterize the radiation environment around the Moon and its potential effects on future lunar explorers and much, much more! Workshop participants will learn about these and other recent discoveries, reinforce their understanding of lunar science concepts, gain tools to help address common student misconceptions about the Moon, interact with lunar scientists and engineers, work with LRO data and learn how to bring these data and information to their students using hands-on activities aligned with grades 6-9 National Science Education Standards and Benchmarks. Workshops will take place: June 24-28 and July 8-12, 2013, at NASA’s Goddard Space Flight Center in Greenbelt, Md. Workshop participants will have the opportunity to tour the LRO Mission Operation Center and the Goddard spacecraft testing facilities. Each workshop will be limited to 25 participants. Interested educators are encouraged to apply early to secure a spot. For more information and to register for the workshops, visit http://lunar.gsfc.nasa.gov/lwe/index.html. Questions about these workshops should be directed to Katie Hessen at Katie.K.Hessen@nasa.gov. NASA’s Lunar Science Institute is hosting a weeklong institute for high school science educators. Participants will receive hands-on standards-aligned classroom resources that bridge the topics of Earth and the Moon, as well as a variety of science and engineering topics. Tours of scientific research facilities and interaction with lunar scientists will also take place during the institute. The Unknown Moon Institute takes place June 24-28, 2013, in Laurel, Md. Registration is free, and applications are considered on a first-come, first-served basis. For more information and to apply for the institute, visit http://www.lpi.usra.edu/education/workshops/unknownMoon/. Questions about this opportunity should be directed to Christine Shupla at shupla@lpi.usra.edu. NASA’s Stratospheric Observatory For Infrared Astronomy, or SOFIA, is a 747SP aircraft carrying a 2.5 meter-diameter telescope. The SOFIA Airborne Astronomy Ambassadors Program is seeking educator teams of two to participate in an upcoming SOFIA flight. One of the team members must be a middle- or high-school educator. Applicants must be U.S. citizens or legal residents teaching in a U.S. school. Applications are due May 3. For more information and to apply online, visit http://www.seti.org/epo/SOFIA. Questions about this opportunity should be directed to Pamela Harman at pharman@seti.org. The Institute for Earth Science Research and Education, in collaboration with Queens College/City University of New York, is seeking participants for summer professional development workshops in the third year of its Climate Science Research for Educators and Students project. This project seeks to improve student engagement in climate science by helping teachers and students develop authentic climate-related science research projects. During summer 2013, two climate science workshops will take place in New York City. The first workshop will be held in late June. The workshop will focus on understanding sun/Earth/atmosphere interactions and Earth’s radiative balance. All participants will build instruments called pyranometers, which monitor solar radiation. A follow-up workshop will take place later in the summer. During the summer, participants will conduct their own research. Questions about this competition should be directed to David Brooks via email at brooksdr@drexel.edu. Clouds, of course, are another form of water. But it’s not easy to tell from the ground how much water is actually in the clouds above us. They may look very threatening but produce very little precipitation. In the classroom activity called “Sizing Up the Clouds,” the teacher sets up three simulated clouds representing three different cloud types. Students use different methods to estimate precipitation contents of each cloud type. Each method is roughly analogous to methods actually used in weather forecasting. Finally, the precipitation from each cloud is released, and the students will compare their estimates to what is actually experienced on the ground. “Precipitation” in this activity is represented by colored chocolate candies, which may help to keep the students’ attention! Find the activity in PDF format at http://spaceplace.nasa.gov/classroom-activities/#cloudcontent. The Long-term Engagement in Authentic Research at NASA, or LEARN, Project is seeking educators for an innovative program that provides onsite research and training opportunities with NASA scientists in the summer and guided research projects that continue on throughout the school year. Participants conduct their own research with help of a team of NASA scientists and share and integrate these projects into the classroom. This summer, participants will complete two weeks of onsite work at NASA’s Langley Research Center during the weeks of July 8-12 and July 15-19, 2013. Teachers will receive approximately 70 hours of professional development. Onsite work will be followed by continued research through 2014 via virtual research team meetings and data presentations. A stipend is offered. This opportunity is open to science, technology, engineering and mathematics educators of grades 6-12. Earth science, physics, chemistry and mathematics teachers are encouraged to apply. Application is open to U.S. citizens only. Applications are due April 22. For more information and to register for the workshops, visit http://science-edu.larc.nasa.gov/LEARN/. Questions about these workshops should be directed to Margaret Pippin at m.pippin@nasa.gov. NASA’s Global Precipitation Measurement (GPM) mission has teamed up with the Japan Aerospace Exploration Agency to hold a design challenge for people around the world to develop an anime character to represent the GPM mission. GPM is a satellite mission that will use multiple satellites orbiting Earth to collect rain and snow data worldwide every three hours. Participants should learn about the GPM mission and design their characters to represent the mission’s objectives. The winning character will star in a comic series that will teach the public about GPM and precipitation science. Participants must be at least 13 years old. Entries must be submitted by April 30, 2013. For more information, including instructions for submitting a character design, visit http://pmm.nasa.gov/education/anime. Questions about this opportunity should be directed to GSFC-GPM@mail.nasa.gov.